Can be trimmed for a customized fit. Made with 3/8" (1 cm) foam laminate material with a hook compatible outer layer. Movable medial and lateral stay pockets can be placed at any position orangle. Three posterior stays are removable and malleable for acustomized fit. Alternating 1-1/2" (3.8 cm) loop lock straps provideeven compression. 2" (5.1 cm) patellar compression strap helps preventswelling. 19" (48.3 cm) L, 29" (73.7 cm) Circumference Thigh, 21" (53.3cm) Circumference Calf. AllegroMedical.com presents The Cut-Away Knee Immobilizer. Can be trimmed for a customized fit. Made with 3/8" (1 cm) foam laminate material with a hook compatible outer layer. Movable medial and lateral stay pockets can be placed at any position orangle. Three posterior stays are removable and malleable for acustomized fit. Alternating 1-1/2" (3.8 cm) loop lock straps provideeven compression. 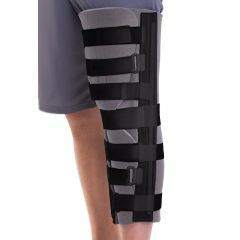 2" (5.1 cm) patellar compression strap helps preventswelling. 19" (48.3 cm) L, 29" (73.7 cm) Circumference Thigh, 21" (53.3cm) Circumference Calf.